Stop Press. 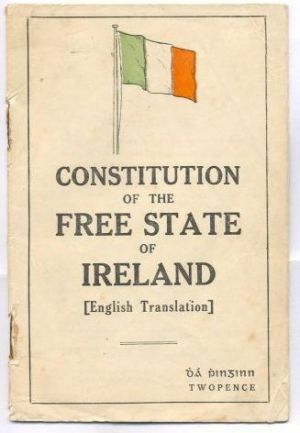 Poblacht na h-Eireann. War News No. 3. 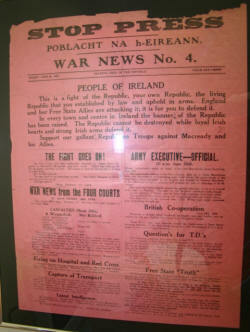 Poster dated Friday June 30 1922, printed one side only, on yellowish paper, circa 500 mm x 380 mm. Fold marks, minor tears but without loss. 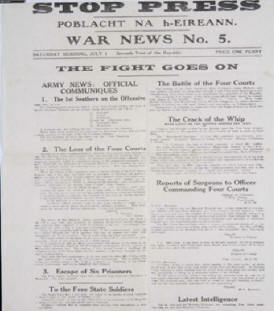 Includes a report dated 29 June, stating 'All Well at the Four Courts .. The attack .. is a complete failure .. Despite the continuous heavy gun and rifle fire, the defences of the Four Courts are intact.' 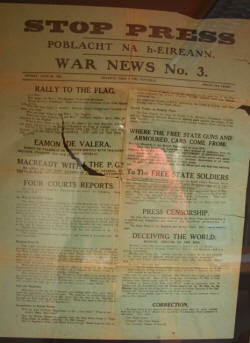 In fact, shelling by the Free State Army set the Four Courts on fire early on Friday morning, and the garrison dumped their arms and surrendered at noon. * Includes. "PEOPLE OF IRELAND. This is a fight of the Republic, your own Republic, the living Republic that you establish by law, & uphold by in arms. England and her Free State Allies are attacking it; it is for you to defend it. In every town and centre in Ireland the banner of the Republic has been raised. 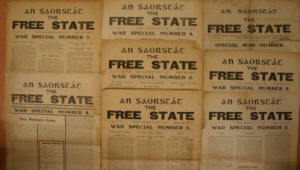 The Republic cannot be destroyed while loyal Irish hearts and strong Irish Arms defend it. Support our gallant Republican Troops against Macready and his Allies." 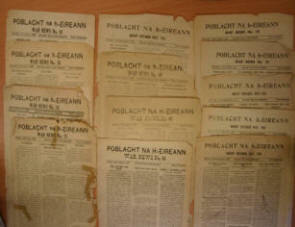 Stop Press: Poblacht na h'Eireann. War News No. 6 Sunday July 2, . Approx. 49cms x 33cms (19 1/4" x 13") printed one side only on light green paper, framed &	glazed. V. . Includes: "THE FIGHT GOES ON - LATEST INTELLIGENCE - OFFICIAL. I.R.A. 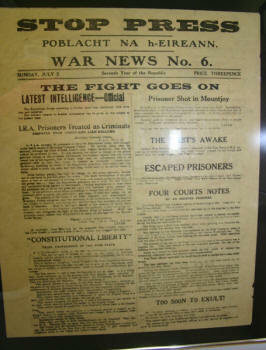 PRISONERS TREATED AS CRIMINALS - DISPATHC FROM COMDTS-GEN. LIAM MELLOWS. 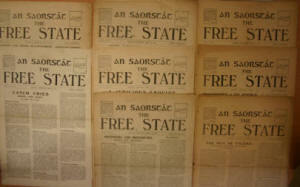 MOUNTJOY,"
An Saorstat: The Free State Periodical Published by the Free State Side who supported the treaty. 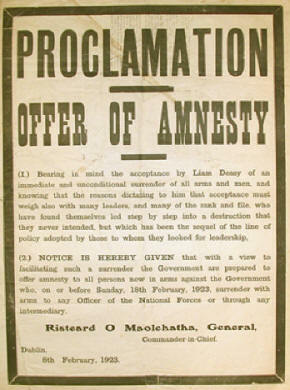 Broadside: Proclamation, Offer of Amnesty, Poster issued by General Risteard O'Maolcatha (Mulcahy), Commander-in-Chief (Free State Army), dated 8 February 1923, offering an amnesty to "All persons now in arms against the Government who, on or before Sunday 18 February 1923, surrender with arms to any officer of the National Forces through any intermediary."